221 South Oak is closed for the winter season. We reopen for the summer May 23rd. You may call 970-728-9507 for a reservation. Gift certificates and Eliza’s cookbooks are available for purchase. 221 South Oak is a restaurant set in a tastefully refurbished historic home, just steps from the Gondola in Telluride Colorado (click here for a photo tour of the restaurant). For years, 221 has been renowned for its intimate atmosphere, delectable cuisine, extensive wine list and uncompromising quality. The friendly knowledgeable service perfects your fine dining experience in Telluride. Join Eliza for her cooking demonstration and wine pairing classes this summer. Upcoming class schedule will be announced soon. The fee for the class is $150 per student. 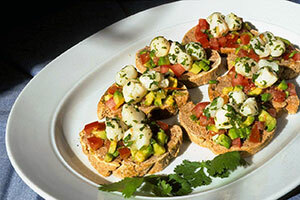 Learn how to cook appetizers, finger foods and canapes. 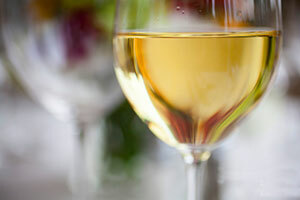 This class will include tasting of 12 recipes with 7-9 wines. Please email Eliza at 221southoak@gmail.com to sign up for this course. Eliza is open to private classes and requests for classes not listed here. The current featured artist for 221 South Oak is Marshall Noice. If you are interested in knowing more about the artist and his work please go to his Telluride gallery’s website lustregallery.com. 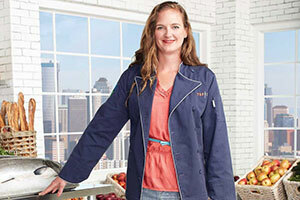 Award-winning chef and owner of 221 South Oak, Eliza Gavin, earned a spot in Season 10’s Top Chef competition on Bravo. The Summer of 2012 she left on a secret journey to film the show and to test her culinary talents against a select group of chefs from across the country. In this class chef Eliza Gavin prepares 14 different appetizers. You will learn her cooking techniques, trade secrets and sample amazing appetizers. Seven wines of the world will be paired with the appetizers to allow a full understanding of the delicate balance of wine pairing. With fine dining, the wine selection can be just as important as the food itself. 221 South Oak has painstaking put together an extensive and varied wine list with the help of a Master Sommelier. The list is crafted to enhance the nuances of unique flavors in chef Eliza’s cuisine.